The towns that indicated the highest percentage of interest in signing up for services were chosen as those to first receive border-to-border FTTH coverage. Last July the organization started the make ready phase of the pole attachments, and they anticipate completing the process and being fully licensed for the poles between late April and June. ECFIber has already issued a Request For Proposals (RFP) for construction to build the new infrastructure and link it to their existing network. This year, ECFiber expects to deploy approximately 250 road miles of fiber. They expect to add 350 and 450 road miles in 2018 and 2019 respectively. ECFiber finds that demand is typically high in the areas where they deploy because residents use slow DSL running at around 1.5 Megabits per second (Mbps) download and even slower upload speeds. New ECFiber customers usually switch from FairPoint, but a few had cable, wireless, or satellite. Williams stresses that one of the keys of success of the project has been the ability for all 24 communities to work together. Without the scale of a group of rural towns, the project would not be profitable enough to survive. He also points out that the network has relatively low costs and stays frugal. Chuck Sherman, an ECFiber customer in Strafford lives on Pennock Road, a rural area that abuts the Podunk Wildlife Management Area. There are a total of eleven residences on Pennock Road and an adjoining private drive; ECFiber serves every property. According to Sherman, there are still “new customer” signs gracing properties, even though ECFiber has been serving everyone in the area for some time now. He’s spoken to his neighbors and every one seems satisfied with their service. Chuck: Hey, there, how are you? FairPoint Fellow: Good, thanks. How ‘bout you? Chuck: Good. What’s up? You know if you’re coming to fix that phone line that went out after that last storm, it’s been gone a while now. FairPoint Fellow: Oh no. We’re going to be putting DSL in here and we're getting a look at the layout. Chuck: What? Why? You know, everyone on this road already has fiber. FairPoint Fellow: Ah, ECFiber won’t last. Chuck: (laughs) It won’t huh? Well, everybody on this road has had it for over a year. Everybody I talk to likes it. Chuck: So, who’s paying to install DSL here when there’s already fiber Internet access to every house? FairPoint Fellow: It’s federal funding that they’re giving us to build it, so we have to build it. In 2015, the federal government awarded FairPoint a little less than $8.8 million per year for six years from the Connect America Fund Phase II (CAF II) program. The total is about $52.8 million to provide DSL connectivity to 28,399 homes and businesses in Vermont. Incumbent providers were given the option to accept or refuse CAF II funding and FairPoint accepted, so no other potential providers had the opportunity to bid on deployment in the state. By the time FairPoint finishes, the technology they’re deploying will be even farther behind the FTTH that ECFiber already has in place, often in the areas where FairPoint is constructing new DSL infrastructure. To build DSL to each property costs approximately $1,860, which is comparable in cost to what ECFiber spends to hook-up a home or business to their own fiber network. The difference is that FTTH is future proof while DSL is already outdated. Contributing to the problem, says Thomae, is that data is 12 to 18 months old. As a result, CAF II funding will fund DSL connections in areas where ECFiber is already serving residents and businesses with FTTH. Thomae notes that there are still areas in Vermont where DSL will be an improvement, but FairPoint doesn’t appear to be prioritizing those areas. Otherwise, they would not be overbuilding in areas where ECFiber is already serving customers with better technology than DSL. FairPoint offers the typical gimmicky low introductory rates and advertises heavily in ECFiber territories, but they still aren’t able to lure ECFiber subscribers. In the past five years, there have been few disconnects at ECFiber and most have been for non-payment. In fact, many residents and businesses tired of poor connections and bad customer service from FairPoint have signed up with the network as soon as the opportunity arises. Consolidated Communications plans to purchase FairPoint, but only time will tell if the change will impact FairPoint operations in Vermont. In every community where ECFiber offers service, they also provide their highest tier for the lowest rate to municipal facilities, schools, and libraries. Currently, those institutions pay $74 per month for 500 Mbps symmetrical service. In about six months, the capacity will increase to 1 Gbps. A high school in Woodstock needs gigabit connectivity but ECFiber isn’t able to expand to that area of town just yet, so the school has decided to enter into a contract with a private provider. In order to get gigabit connectivity, they must commit to a three-year contract for $2,000 per month. For now, they’ll pay $24,000 per year; if ECFiber were serving them, annual costs would be around $900. Monroe notes that the folks at ECFiber see a lot of demand wherever they deploy. Many of these rural areas have lost population because they need broadband in order to participate in the 21st century. One of the reasons subscribers switch and stay with ECFiber has to do with symmetrical connectivity, which accommodates Vermonters’ entrepreneurial spirit, speculates Thomae. Vermonters have always started businesses in their own homes and they keep them in their homes as long as they can because the overhead is low in your own basement or your garage. We are supporting all sorts of home-based businesses. They might be making some food product or they might be making a fabric product or telecommuting to do some kind of advanced software development or engineering work. You can’t do that through a DSL connection. They’ll soon kick off the campaign to determine where they’ll build in 2018 and by the end of May, ECFiber will know which communities will be next up for depolyment. For more converage on ECFiber, check out Christopher's interview with Carole Monroe back in 2015, when they talked about the crowd funding model and how the network was already bringing benefits to the communities it served almost two years ago. You can also read more of our coverage that goes back to 2009. 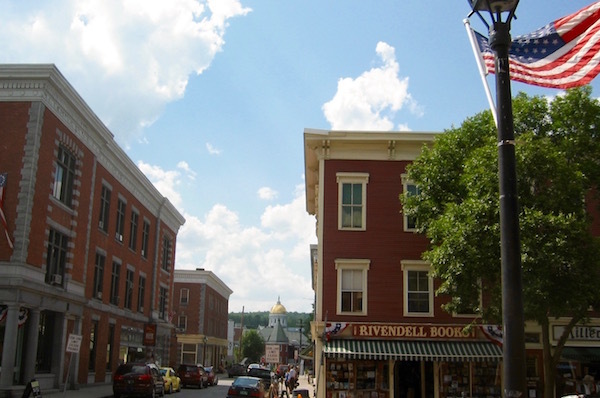 Photo of Montpelier with state capitol in the distance by Skeezix1000 (Own work) via Wikimedia Commons.